In the 1970s Steve Mondrowski grew up in a rough Chicago neighborhood. As soon as the sun set, many parents in the area ushered their children inside and locked the doors. When Mondrowski, now a Highland Park resident, was 10, he had the opportunity to attend House In The Wood summer camp. Not only was he exposed to fishing, swimming and boating, but he also had the freedom to enjoy outdoor evening activities, including Capture the Flag. Mondrowski says he went from survival of the fittest and always looking over his shoulder to learning to trust others and work as a member of a team. House In The Wood, a Northwestern Settlement program, hosts 400 children from Chicago’s neediest and most violent neighborhoods at a summer camp in Wisconsin and helps almost 1,100 children year-round through STEM-based outdoor education programs for Chicago elementary and high schools. The mission of House In The Wood camp is to nurture, educate and inspire youth. The Northwestern Settlement has been offering camping experiences to Chicago youth since 1897, but the camping program escalated considerably in 1910, when House In The Wood was founded. The nonprofit will hold its 2018 House In The Wood Gala October 13 at Venue Six10 in Chicago. Inspired by the six joyful years he spent at House In The Wood camp, Mondrowski purchased a home near Delavan Lake, where he enjoys taking his wife of 25 years, their 14-year-old son and 8-year-old daughter to reminisce about his experiences. Mondrowski started as a camper in the early 1970s, and he worked as a kitchen boy assisting in the preparation of meals for the campers before becoming a counselor at 16. He says the camp food was probably better than most of the food he ate at home. Mondrowski recalls how excited he was when he moved to the new cabins during his second year at the camp. The new cabins were built around 1973, housing about 60 kids. “The cabins were beautiful, compared to the old building,” he says. In addition to the water activities at the camp, Mondrowski also enjoyed playing football, baseball and basketball. He stopped attending the camp because of his family’s move to a western suburb. “I’m excited that the camp is still thriving and bringing joy to so many well-deserving kids,” Mondrowski says. 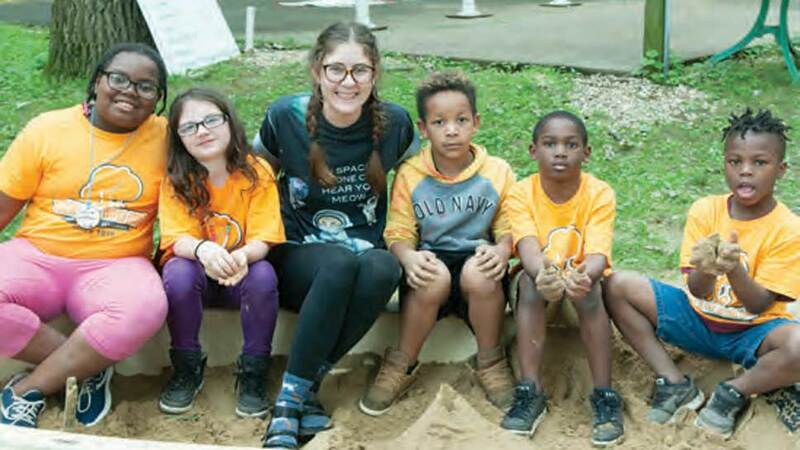 Nearly a decade before Mondrowski’s first House In The Wood camp experience, Chicagoan Maryanne Jakubowski — at the age of 10, in 1966 — began the first of her three sojourns at the camp. She suffered initially, from homesickness, but care packages from her mom helped the healing process. Among her fondest camp memories was learning how to swim. Time spent near the lake also thrilled her. One of her favorite activities was singing songs after dinner in the mess hall; she still sings some of them to her grandchildren. Jakubowski notes “Heads, Shoulders, Knees and Toes” ranks No. 1 on her list of top camp songs. Jakubowski never saw any of the campers again, but she and a fellow camper became pen pals — and remained ones for 10 years. When Jakubowski and her husband became empty nesters 15 years ago, they drove to Wisconsin to see the camp. It wasn’t how she had remembered it. “Now there are so many more buildings, along with the recreation center,” she says. During the school year, a young Jakubowski also participated in an after-school program — a weekly arts and crafts class — at Northwestern Settlement. Jakubowski’s recollection of her childhood versus Mondrowski’s is quite different. “I didn’t realize my parents were poor growing up,” Jakubowski says. “I also never realized how important the Settlement House was to the neighborhood. North Shore Board of Northwestern President Schaff has been affiliated with the board for 10 years. Volunteering for it, as well as seeing the positive impact the camp has on wide-eyed children, moves her. The 2017 House In The Wood Gala raised more than $510,000 for the camp. Schaff says the board has a similar goal this year. “I love volunteering beside friends who share my determination to open doors to better futures for children,” she adds. The 2018 House In The Wood Gala, a black-tie-optional affair, will be held October 13 with a VIP reception at 5:30 p.m. at Venue Six10, 610 S. Michigan Avenue, Chicago. The gala will feature live music by The North 41, food, craft cocktails by Tito’s and a benefit auction to open doors to better futures for children at Northwestern Settlement’s award-winning House In The Wood camp. For more information visit northshoreboard.org.